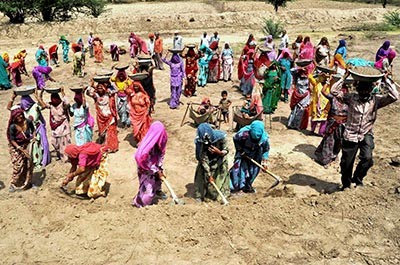 Several civil society organizations, led by Anna Adhakaar Suraksha Andolan (AASA), have taken strong exception to the Government of India allocating just Rs 55,000 crore for the financial year 2018-19 towards the rural jobs scheme under the National Rural Employment Guarantee Act (NREGA), the same as that of this year's. They had demanded allocation of Rs 80,000 crore. Pointing out that the initial budget of Rs 48,000 crore was increased to Rs 55,000 crore in January for 2017-18, AASA, a right to food advocacy group, has expressed the apprehension that "given the trend of rising pending liabilities at the end of every year, a sizable part of the 2018-19 budget will be utilized for clearing previous years’ payments." Noting that the new budget has not addressed several of the issues which have led to this situation, AASA says, this year, there have been "long and unpredictable delays in wage payments", with the Union Ministry of Rural Development releasing NREGA funds "only after states meet its requirements such as submission of various documents", thus "unfairly penalizing NREGA workers", who are often not paid for months Bihar and Jharkhand. Ina statement, issued along with NREGA Sangharsh Morcha, it says, "Workers are not compensated for the delays in wage payments", adding, independent researchers have found that if in 2016-17, 43% of workers received "full compensation, while in 2017-18 year "this proportion fell to 14%". It adds, things have not stopped here. "The Centre has, through arbitrary, illegal means like the Approved Labour Budged reduced the number of days of work. For 2017-18, the Projected Labour Budget was reduced by 25%, from 288 crore persondays to 215 crore persondays, resulting in a deficit of over Rs 17,500 crore in 2017-18." Then, notes AASA, "Real NREGA wage rates have stagnated for several years now. In fact, currently the NREGA wage rates of 17 states are less than the corresponding minimum wages. The government has ignored the recommendations of successive committees to reconcile between MGNREGA wage rates and state minimum wages." Agreeing, the National Alliance of People's Movements (NAPM), apex body of tens of grassroots organizations across India, says that "the continued apathy of the NDA government towards NREGA was visible" with the Finance Minister refusing to even mention it in his speech, adding, on the other hand, "The Direct Benefit Transfer found mention", but there was no special focus on "poor malnutrition and food security." Pointing out that the budget made a "big announcement on celebrating Gandhi’s 150th Birth Anniversary", even as "ignoring Gandhian economics", which encompasses self-sufficient village economy and idea of localisation and swadeshi, NAPM, which is led by well-known social activist Medha Patkar, regrets, there is a "50% cut in the allocation handloom sector", on which the unorganized sector depends. In a separate statement, the Delhi Solidarity Group (DSG) laments that allocation for the Scheduled Castes (SCs) has been further reduce to 2.32% of the total budget from 2.44% and 2.38% in the previous two years. India's SC population is 16.2%. While the Scheduled Tribe (ST) allocation is slightly higher (1.60%) than what it was over the last two years, 1.49% and 1.47% of the total budget, DSG notes, even the meagre amount allocated for SCs and STs was never spent. "In the year 2014-15, Rs 20,513 crore and in the year 2016-17 Rs 4,499 crore remains unspent from the welfare fund of SCs", DSG states, adding, "For STs Rs 12,466 crore remain unspent in the year 2014-15 and in the year 2016-17 it is Rs 2,195 crore."